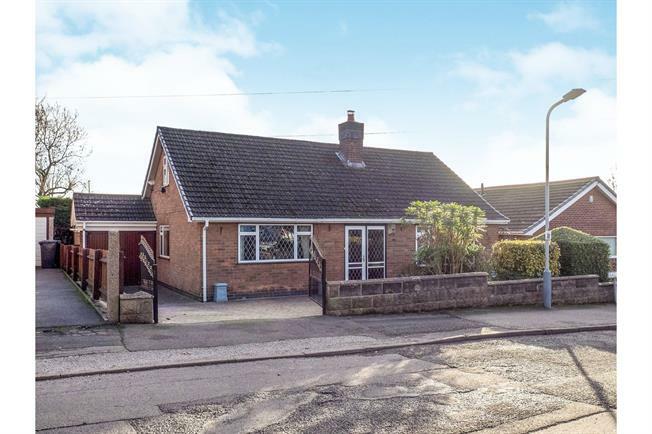 4 Bedroom Detached Bungalow For Sale in Nottingham for Offers Over £270,000. Spacious four bedroom detached dormer bungalow which is in a quiet and popular location. The property is stunningly presented throughout and briefly comprises of; a light and airy entrance hall, lounge with a log burner, large kitchen, dining room, conservatory, modern four piece suite bathroom and two bedrooms with the master benefitting from having fitted wardrobes. To the first floor are two further double bedrooms and second bathroom. Outside the property to the front in a large drive allowing access for several cars and a garage as well. To the rear is a generously sized landscaped garden which mainly laid to lawn with mature beds, shed, greenhouse and a paved patio area. A viewing is highly recommended to appreciate the size and quality of this property. Double aspect double glazed uPVC windows. Radiator and wood burner. Double glazed uPVC window. Radiator. Roll edge work surface, wall and base units, stainless steel sink, electric oven, gas hob, over hob extractor, integrated washing machine. UPVC French double glazed door. Double glazed uPVC window. Radiator and air conditioning. Double glazed uPVC window. Radiator. Standard WC, freestanding bath, walk-in shower, porcelain sink. Double glazed uPVC window. Radiator, fitted wardrobes. Double glazed uPVC window. Radiator. Standard WC, panelled bath, shower over bath and porcelain sink.